The Mini-Maze procedure is a surgical procedure of the heart. A pattern of scars are made in the upper chambers of the heart which may look like a maze. The chambers are called the atria. A traditional maze surgery requires the chest to be opened and the heart to be stopped. A mini-maze is done with small incisions and special surgical tools. This often leads to shorter recovery time and lower risk of infection. The Maze procedure is done to cure atrial fibrillation . Fibrillation is abnormal beating of heart muscle. 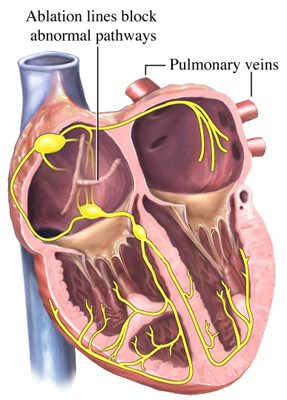 It is caused by erratic electrical impulses that travel through the heart muscle. These impulses can cause the chambers to beat too fast. This can decrease blood flow through the heart. Atrial fibrillation can also cause blood clots to form in the heart that can travel to the brain and cause a stroke . The Maze procedure is used to treat severe cases that did not respond to medication or other procedures. Electrical impulses cannot flow through scar tissue. By creating specific patterns of scar tissue, maze surgery creates a pathway for healthy impulses and blocks erratic impulses. Talk to your doctor about your medications, including over-the-counter medications. You may be asked to stop taking some medications up to one week before the procedure. Arrange for someone to drive you home from the hospital and help you at home. If you smoke, it is best to stop. General anesthesia will be used. You will be asleep during the surgery. You may also be given a sedative before surgery to help you relax. Minimally invasive procedure only requires small cuts to be made in the chest wall. Two small incisions will be made along your side. A small camera will be inserted through one of the incisions. The doctor will be able to look at the heart with this camera. A second tool will be used to create small areas of scar tissue. The tip of the tool uses extreme cold or radiowaves to destroy small areas of tissue. This process is called ablation. Once the chosen areas have been treated, the instruments will be removed. The skin will be closed with stitches or staples. Your recovery will be monitored in the intensive care unit. Your heart’s activity will be recorded by ECG. Pain medication will be given to help you rest comfortably. Fluids and pain medication will be given through an IV line. You may be given medication to help control the build-up of fluids. Efforts will be made to get you out of bed and walking as soon as possible. You will be asked to do deep breathing and coughing exercises. This will help reduce the risk of fluid build-up in your lungs. Rest when needed. At first, it is normal to feel more tired than usual. Walk daily. Activity will help with the healing process. Limit certain activities until you have recovered. Cardiac rhythm disturbances. Society of Thoracic Surgeons website. Available at: https://ctsurgerypatients.org/adult-heart-disease/cardiac-rhythm-disturbances. Updated July 2016. Accessed November 28, 2017. Maze procedure for treatment of atrial fibrillation. University of Southern California Cardiothoracic Surgery website. Available at: http://www.surgery.usc.edu/cvti/mazeprocedure.html. Accessed November 28, 2017. Maze surgery. Texas Heart institute website. Available at: http://www.texasheart.org/HIC/Topics/Proced/mazes.cfm. Updated August 2016. Accessed November 28, 2017.